President of USA Barack Obama has flown out of Afghanistan after a surprise six-hour visit. Air Force One took off from Bagram airbase after Obama had rallied US troops with a rousing speech and told Afghan President Hamid Karzai progression fighting corruption should match military gains. Obama pledged there would be no let-up in the fight against the insurgency. 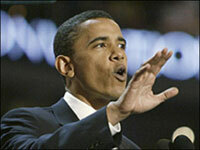 He said: “We are going to disrupt and dismantle, defeat and destroy al-Qaeda and its extremist allies. That is our mission and to accomplish that goal our objectives here in Afghanistan are also clear. We’re going to deny al-Qaeda safe haven,” Euronews reports. According to Seven Sided Cube, past December Obama announced that he would be sending more 30,000 additional US marines to the country to tackle insurgent groups and other crisis in the country as per wish of Karzai and other authorities. Speaking to the US troops during his visit he told them his feelings about the mission and why they were there. He said, "We can’t forget why we’re here. We did not choose this war. This was not an act of America wanting to expand its influence; of us wanting to meddle in somebody else’s business. We were attacked viciously on 9/11." Obama last visited Afghanistan in 2008 as a presidential candidate, a trip that sparked great enthusiasm among ordinary Afghans. Many in the country cheered his election, believing Afghanistan would be a top priority of his presidency. That initial jubilation has waned somewhat as the war grinds on and daily life remains a struggle, but Obama remains far more popular than his predecessor, George W. Bush, San Francisco Chronicle reported.